The badge holder demonstrates a complete understanding of their client’s availability needs. Optimizes the availability of IT infrastructure, systems, and services to meet the commitments IBM has made to it’s clients in a cost-effective manner. Proactively identifies cost-effective availability improvements within an availability plan. Analyzes availability challenges and eliminate chronic issues. 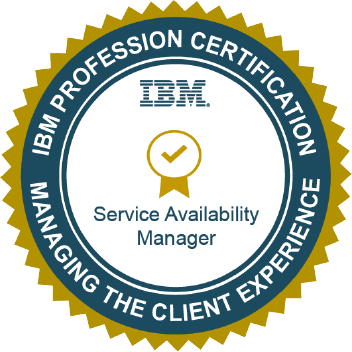 Ensured quality delivery of services to an IBM client using their knowledge of their client's availability demands and expectations. Demonstrated leadership, client management and team building skills as they pertain to their availability plan for the clients assigned. Collaborated with other account leaders to look for ways to improve service availability through innovation and automation. Successfully ensured new services were designed to deliver the levels of availability required by the business.